DECEMBER 12.30.2013.- HRISTO SHOPOV.com INTRODUCES ITS VERSION 4 TO 2014!! 12.15.2013.- OTHER WORKS - OTHER COLLABORATIONS » New video: "Mutra" Novel - Hristo Shopov`s monologue. - OTHER WORKS - OTHER COLLABORATIONS » Hristo Shopov collaborates with solidarity campaign "Let Fingerprints II" / “Да оставим следи II”. 12.14.2013.- NEWS - WHAT'S ON HRISTO SHOPOV » Hristo Shopov collaborates with solidarity campaign "Let Fingerprints II" / “Да оставим следи II”. 12.09.2013.- FILMOGRAPHY »"THE TREE OF LIFE II: THE WRATH OF HUMBLED" : New videos (Official Trailer and selected scenes episode #12). 12.01.2013.- FILMOGRAPHY »"THE TREE OF LIFE II: THE WRATH OF HUMBLED" : New videos (Official Trailer and selected scenes episodes #9, #10 and #11). 11.10.2013.- FILMOGRAPHY »"THE TREE OF LIFE II: THE WRATH OF HUMBLED" : New videos (Official Trailer and selected scenes episode #8). 10.23.2013.- FILMOGRAPHY »"THE TREE OF LIFE II: THE WRATH OF HUMBLED" : Selected scenes and trailers of chapters #2, #3, #4 and #5. 09.30.2013.- GALLERY » New pictures of "The Tree of Life 2" (Hristo Shopov/Jordan #5) and "Fourth Estate" (Hristo Shopov #6). 09.29.2013.- FILMOGRAPHY » "FOURTH ESTATE": New video (The Actors of "Fourth Estate": Hristo Shopov). 09.22.2013.- GALLERY » First photos for "The Tree of Life II: The Wrath of Humbled" (Hristo Shopov/Jordan #1, #2, #3 and #4) !!. - FILMOGRAPHY »"THE TREE OF LIFE II: THE WRATH OF HUMBLED" : New video (Official Trailer #3) and poster. - GALLERY » New picture of "FOURTH ESTATE" (Hristo Shopov #5). 09.10.2013.- FILMOGRAPHY »"THE TREE OF LIFE II: THE WRATH OF HUMBLED" : New video (Official Trailer #2). 09.07.2013. - NEWS » UPCOMING MOVIES: Premiere for "FOURTH ESTATE": September 29, at 20.45 on BNT1. 09.05.2013. - NEWS » WHAT'S ON HRISTO SHOPOV: New photo of Hristo Shopov playing Jordan Valchev in "THE TREE OF LIFE II: THE WRATH OF HUMBLED". - FILMOGRAPHY »"THE TREE OF LIFE II: THE WRATH OF HUMBLED" : New video - Official trailer #1. 09.03.2013. - NEWS » UPCOMING MOVIES: Premiere for "THE TREE OF LIFE II: THE WRATH OF HUMBLED": September 22 on TV7. 08.30.2013.- FILMOGRAPHY »"THE TREE OF LIFE II: THE WRATH OF HUMBLED" : New info and photo. - NEWS » WHAT'S ON HRISTO SHOPOV: THE TREE OF LIFE II IS BACK! - NEWS » UPCOMING MOVIES: Release Date of "THE TREE OF LIFE II: THE WRATH OF HUMBLED" and new photo. 08.22.2013.- FILMOGRAPHY » "FOURTH ESTATE": New video (Commercial Clip #5). 08.19.2013.- GALLERY » First photos for "Fourth Estate" (Hristo Shopov #1, #2, #3 and #4) !!. 08.18.2013.- FILMOGRAPHY » "THRE TREE OF LIFE II": Section updated with the second season of this series (currently filming) starring Hristo Shopov. - FILMOGRAPHY » "FOURTH ESTATE": New synopsis. 08.11.2013.- NEWS » UPCOMING MOVIES : FOURTH ESTATE - New photos, poster and info. - NEWS » WHAT'S ON HRISTO SHOPOV : FOURTH ESTATE - New photo. - FILMOGRAPHY » "FOURTH ESTATE": New photo. 08.01.2013.- FILMOGRAPHY » "FOURTH ESTATE": New information, subject and videos (Commercial Clip #2 and #3). - LATEST FROM HRISTO SHOPOV.com » New images. 07.29.2013.- LINKS OF INTEREST » HRISTO SHOPOV.com's LINKS : HRISTO SHOPOV.com on Flipboard-Magazine. 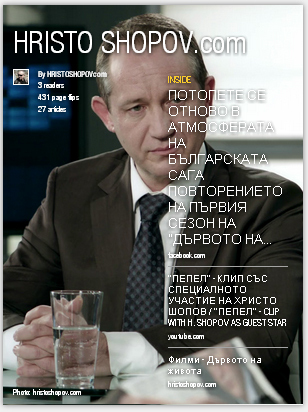 07.20.2013.- NEWS » WHAT'S ON HRISTO SHOPOV : FOURTH ESTATE - New photo. 07.06.2013.- FILMOGRAPHY » "FOURTH ESTATE": New poster for this film. 07.02.2013.- HRISTO SHOPOV.com created a Magazine on Flipboard ! 06.25.2013.- FILMOGRAPHY » "FOURTH ESTATE": New information, subject and video. - NEWS - UPCOMING MOVIES » Release Date of "FOURTH ESTATE". 06.16.2013.- DESKTOP » New wallpaper of "THE TREE OF LIFE". 06.02.2013.- FILMOGRAPHY » "THE TREE OF LIFE": New photos, video ("header") and content. - GALLERY » New photos of "THE TREE OF LIFE" (Hristo Shopov/Jordan #19, #20, #21 and #22). 05.28.2013.- FILMOGRAPHY » "THE TREE OF LIFE": New photos and content. 05.17.2013.- FILMOGRAPHY » "THE TREE OF LIFE": New video - Episode 11 Trailer. 05.08.2013.- OTHER WORKS- VIDEO CLIPS » New photos and commercial clip for the new Konstantin Katsarov's book "Dust". 05.07.2013.- GALLERY » New photos of "THE TREE OF LIFE" (Hristo Shopov/Jordan #14, #15, #16, #17 and #18). 05.04.2013.- FILMOGRAPHY » "THE TREE OF LIFE": New video - "The Past Determines the Future". 04.28.2013.- FILMOGRAPHY » "THE TREE OF LIFE": New videos - Episodes 8 and 9 Trailer. 04.12.2013.- FILMOGRAPHY » "THE TREE OF LIFE": New video - Episode 7 Trailer. 04.10.2013.- GALLERY » New photos of "BARABBAS" (Hristo Shopov/Kedar #1, #2, #3, #4 and #5). - FILMOGRAPHY » "BARABBAS": New content and photos. 04.05.2013.- FILMOGRAPHY » "THE TREE OF LIFE": New video - Episode 6 Trailer. 03.29.2013.- FILMOGRAPHY » "THE TREE OF LIFE": New video - Episode 5 Trailer. 03.28.2013.- FILMOGRAPHY » "BARABBAS": Release date & time in Europe. 03.20.2013.- FILMOGRAPHY » "THE TREE OF LIFE": New photos and trailers (episodes 3 and 4). 03.18.2013.- FILMOGRAPHY » "BARABBAS": Release date, new pictures and video of the film (Behind the Scenes). 03.08.2013.- GALLERY » New photo of "THE TREE OF LIFE" (Hristo Shopov/Jordan #13). 03.04.2013.- FILMOGRAPHY » "THE TREE OF LIFE": New video - Episode 2 Trailer. - GALLERY » New photos of "THE TREE OF LIFE" (Hristo Shopov/Jordan #9, #10, #11, #12 and Making of #2). 03.01.2013.- FILMOGRAPHY » "BARABBAS": New info, first pictures and trailer #2 of the film. 02.28.2013.- FILMOGRAPHY » "THE TREE OF LIFE": New video - Interview with Hristo Shopov and Evtim Miloshev. 02.27.2013.- FILMOGRAPHY » "THE TREE OF LIFE": New video - Episode 1 Trailer #2. 02.26.2013.- FILMOGRAPHY » "THE TREE OF LIFE": New video - Episode 1 Trailer #1. 02.25.2013.- GALLERY » New photos of "THE TREE OF LIFE" - Premiere (#1, #2, #3, #4, #5, #6, #7, #8, #9 and #10). - FILMOGRAPHY » "THE TREE OF LIFE": New video - Premiere 02.24.2013. 02.23.2013.- GALLERY » New photos of "THE TREE OF LIFE" (Hristo Shopov/Jordan #8 and Making of #1). 02.22.2013.- GALLERY » New photos of "THE TREE OF LIFE" (Hristo Shopov/Jordan #6 and #7 HD). 02.12.2013.- NEWS » UPCOMING MOVIES: Release date for "THE TREE OF LIFE": march 3, 2013 - TV7. - FILMOGRAPHY » "THE TREE OF LIFE": New video -Official Trailer #3. 27.01.2013.- HRISTO SHOPOV.com LAUNCHES NEW WEBSITE ! !